Day 3, 18.5.17. Via de la Plata camino walk, Castilblanco de los Arroyos to Almadén. 29.5 kms. On and off through the night I was shaken from my dreams by snoring, but as I know I ‘give as good as I get’, I could not complain. Later I was woken by my alarm and was the first up. I did try to be careful, indeed I had prepared everything the night before so I could creep out silently, but I forgot I had emptied my pockets and as I moved my clothes I dropped all the coins. They rolled loudly and far on the tiled floor – what a racket! The main street, Castilblanco de los Arroyos. After breakfast, I set off confidently, but down and back I went looking for the arrows to show me the way, and I lost the time I had gained from rising early. Well, I really had to snap this very large statue in the centre of Castilblanco – man with donkey! Attractive house fronts with sign reading Venida Virgen de Escardiel. There is a hermitage dedicated to this Virgin 5 kms from Castilblanco, also a bar named after her! The others were up and out, probably woken by my noise, and so I thankfully followed them. As I walked my head was full of questions. Was this some sort of folly, or a drinking trough for animals, or maybe somewhere to wash your clothes? The reflections of the sky in the water and the Virgin at the apex made a striking sight. Out of the urban environment, there was a long, straight road and glowering sky – the latter an unusual sight in Southern Spain even in May. A dog, black pigs (Spanish ‘jamón’ from this area is world famous) and cockerel, all happily sharing a field. I could not resist the wonderful light and the expanding sun’s rays in this sky. I compared the luminous yellow arrows with the luminous sunny morning. There was no comparison! How does the sun pick out the edges of each leaf, as well as ripples of old bark, which has no shiny surface, and make them gleam? The sun is starting to illuminate the foliage. I hoped that I had built up enough strength during the previous two days for the 30 kilometers ahead of me, and that I would not therefore have to use super-human, prodigious will power. Ah, there was a thrilling bird voice – was it encouraging and reassuring me? It was day three of being on my own. Would I be content to be a hermit or enter one of those retreats like Tenzin Palmo? If I am alone so often anyway, maybe. Then again, like most others I enjoy companionship. It is all about balance. I saw the first lake of this journey. The Canal blog says, ‘Be prepared for a long road this morning.’ (See below). I moved between tarmac and softer gravel, along a bed of dry, brown leaves from last year – it is kinder on my soles. I hear French spoken behind me. It is crisper and much less passionate than Spanish. Later I meet the couple and exchange a while. He does most of the talking and was indeed a crisp sort of person. I passed beautiful irises – just look at that colour! Then a tandem passed me – him with his long back in blue and black, she behind in pink, legs circling of course, in exact time with each other. ‘Buen camino!’ A little further on they get off and walk up the hill, and I realise I have been steadily climbing. There is a long, spider-legged peregrino in front of me, an older man without all the gear behind, and the wheeled couple coast down the other side. There She is again, guarding and blessing the homestead in her beautiful gold cloak and white dress with halo. The walls I trekked between were white and had decorated name plates outside, even the ordinary ones. They have plants in the type of pots you might expect a genie to whisp out of, and they adorn the gatehouse, while the road stretches in to the land behind. It was much hotter by this time, even at 9am. My right hip bothered me a little with the climbing. Crunchy old acorns littered the ground. Here it was more the azure water which stopped me in my tracks. At 10.10am I enter the Parque Natural de Sierra Norte and am off road. The two French people were in front. Not much shade. Fellow pilgrims in the distance. I take my first pee of the morning – oh to be able to stand up and do it like men! Next time I will wear those shorts which you can just pull up and down easily. It is a real struggle to squat with the money belt and rucksack, and then try and do buttons once standing up again. After repetitively walking a long way, bending the knees is hard, although having said that, it is probably good to keep them lithe. A bird sings ‘pee pee pee’! On the Via de la Plata the pointers are mainly yellow arrows, but here was the Saint James shell, the Coquille Saint Jaques, too. I wonder about listening to music as I go along. Alain, who I walked with on the Camino Francés, used to play songs and sing to me, it was a way of getting to know each other. I try, but after a few moments I stop. I like to hear the sounds around me and potter along at my own pace not to the song rhythms. My head is full enough as it is. ‘Never did I think so much, exist so vividly, and experience so much, never have I been so much myself – if I may use that expression – as in the journeys I have taken alone and on foot.’ Rousseau, Discourses on Inequality. Lunch was at 10.40 and what a cacophony of toads down in the stream. Such beauty. The wild flowers flourish near the river. 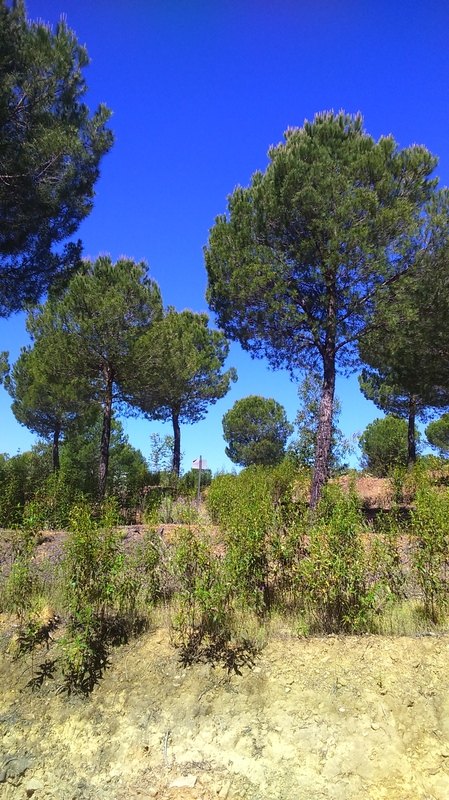 There were soft, soft, fine grasses curving over in the mild breeze, black olive trunks contrasted with swathes of yellow flower heads and hopefully, I mused, I was over half way to Almadén. Ancient olive trees. Only small pools of shade to relieve the heat. I remember trying to pick up my pace but my feet were sore and my ankles stiff. I obviously was not yet into the swing of this amount of daily walking. A bird kept saying ‘bo bo boh’, one with a largish orange-brown breast and a black and white tail. At least I thought that was the one which belonged to that particular call. It can be hard to identify them. There were long, oblong stone troughs for feeding the animals, white-pink stones rather than crystal quartz, very tall trees reminiscent of the ones next to the albergue roof terrace last night. I had watched the leaves meditatively spinning whilst doing my T’ai Chi. Banks of lavender fell down hillside, which when squeezed released a potent and wonderful aroma. Blue sky and fields of lavender. As far as the eye could see there was only trees and nature and natural sounds: I climbed over some water, admired the lollipop pines and inhaled their resiny smell. It all prompted me to take deep breaths. The rivers Huéznar and Viar wind through the Park. And in good time, because there followed a very, very steep, though thankfully relatively short, climb of 550 metres. Half way up was a memorial to a dead pilgrim (Michel Laurent) which seemed appropriate given the gradient. Many people walk the Caminos at the end of their life or because they are unwell and some do die on the way. A ‘mirador’ is a viewing place, somewhere to admire the surrounding countryside. At the top there were three of us and we gave thanks for the cooling wind. I was excited to see the end in sight as well as tomorrow’s path running east to west on the slope opposite. That was to be rather important information the next morning. It was the first town or village I had set eyes on since 6.30am, 6.5 hours ago, and although it was also a very, very steep topple down, and I had to take enormous care because of the boulders and sheer rocks, the reward was at the bottom. And at last I arrived. In Almadén, on the church tower, were 5 of the huge black and white cranes which I had seen in Northern Spain. I love the yellow and white architecture of this part of the north province of Seville. And there is a crane coming in to land. It was actually quite a long walk through the outskirts to the municipal albergue, and I had an unwanted guide, a man who attached himself to me as soon as I entered the town, and kept talking. I did not get a good feeling, perhaps it was because I was tired, but in the end I had to ask him to go away. A welcome bed. The poor French woman leaning over on the left, has blisters, which is hardly surprising given her husband insists they cover 2 days at a time. He is an experienced walker, but this is her first time. I donate my plasters which, thankfully, I do not need. And like most Spanish urbanisations, there were beautiful flowers by the side of the road. Your pics are stunning tamsin. What vivid colours .. and language : ) Thank you for taking me there. Thanks Mhoira. Am bit lost already but hey!